WELCOME to my blog and creative art space! Since our retirement and relocation to the Puna District on the Big Island of Hawaii, (where we proudly admit to being "Punatics") my artistic energies have largely gone into our new home, addition of an ohana/apartment, and our acre of land. We have planted fruit trees, built lava walls, dug holes, reclaimed the boundaries from the jungle, and developed the landscaping. During all this rewarding, hard work, I have wondered in what way the art I had been creating (you can see some below) would transition to reflect this dynamic island life. I have doodled in an art journal as impressions arose, splashed color, scribbled images, words, half-formed raw ideas, inklings of bold color, and fractal-like geometry -- all rather abstract. So, what do I do with all these musings, particularly since it is so VERY different from the art I was creating in Humboldt County? I have some beginning shapes now and color; it is time to play. I'll try to add some of my thoughts here, for those few who are curious. And, if you'd like to know more, you can email me. One of my favorite places is the junk-yard, where on the ground, I find the best rusty stuff -- free. 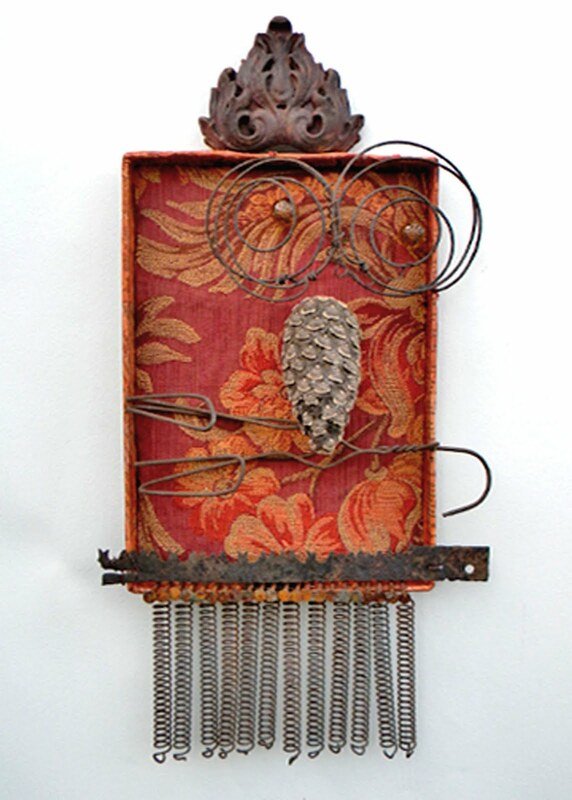 These rusty things worked well with a newly found beach-worn pine cone that happened to look like an owl with his back turned away. The bent coat hanger became the branch, the bed springs became the eyes, and I thought the tightly wound springs at the bottom suggested tail feathers. I weathered and rusted the top finial (originally plastic), and used upholstery samples (in fall colors) for the background.